Civilizations seem always to be striving to supersede their ancestors’ achievements with new inventions, technological breakthroughs and over-the-top architecture. And while yesterday’s flip phones are flung on the trash heap, the iconic architecture of the past remains. We still pay homage to wonders of the world like Stonehenge, the Sistine Chapel, the Great Pyramid of Giza, the Taj Mahal, the Colosseum and the Great Wall of China. We admit their greatness and mourn the loss of wonders crumbled, like the Lighthouse of Alexandria or the Colossus of Rhodes. 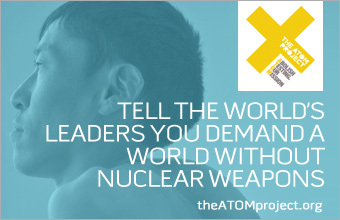 Progress these days seems to mean smallness—witness our shrinking telephones and computers. But in the world of building, size still matters. Many of what are called architectural wonders today are the tallest and most sophisticated modern constructions, like the CN Tower in Toronto (553 meters), Canton Tower (600 meters), the Tokyo Skytree (634 meters) and, of course, the tallest skyscraper today, the Burj Khalifa in Dubai, reaching a massive 829 meters. Of course, it’s not only height that makes a wonder. The Eiffel Tower is 324 meters tall, but it boasts more visitors than any other taller tower in the world, attracting some 7 million tourists per year. It is 38th overall on the list of the world’s most-visited tourist attractions. Architects today face stiff competition—what they make has to stack up against their contemporaries, as well as centuries-old structures. What they build, however, has a chance to leave a mark lasting tens or hundreds of years. For architects building new cities, like Kazakhstan’s Astana, there is also the chance to shape the urban center’s identity. Kazakhstan is in the middle of Central Asia, a vast territory that lies between Asia and Europe. This location endows the country with geopolitical and economic opportunities in both the East and the West, and it’s no surprise that the architecture in one of the world’s newest capitals is so varied and multi-directional. Astana’s edifices combine both European and Oriental motifs, so for visitors from most parts of the world, somewhere, something homey can be found in the Kazakh capital. So this is EdgeKz’s list of the Wonders of Astana. 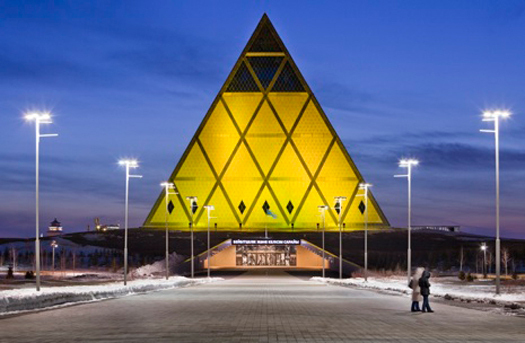 The Pyramid of Peace expresses the spirit of Kazakhstan’s 140 nationalities and the multi-ethnic nation where cultures, traditions and diverse nationalities coexist in peace and accord. It hosts the Congress of Leaders of World and Traditional Religions every three years in its apex, and also houses an opera hall with 1,500 seats, the Museum of National History, the Research Center of World Religions, the Library of Spiritual Religious Literature and exhibition and conference rooms. 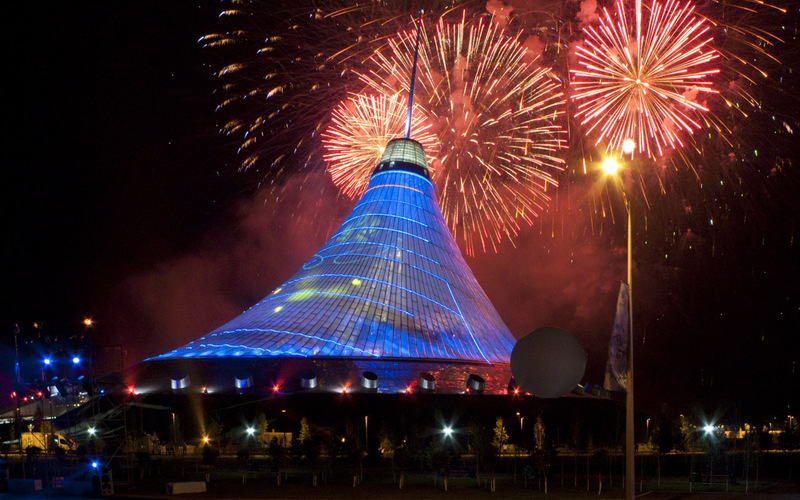 The International Astana Action Film Festivals are also held here. The Khan Shatyr Mall is a large entertainment center and is the world’s largest tented construction. Shaped like a giant tent blowing in the wind, Khan Shatyr accommodates boutiques and international brand outlets, a supermarket, electronics stores, a movie theater, a spa, a food court and a swimming pool. Khan Shatyr was named one of the world’s top 10 eco-buildings by Forbes Style Magazine, the only building from the Commonwealth of Independent States to make the list. “Hazrat Sultan” is translated as “Apostolic Sultan.” The mosque was named in honor of 12th century Sufi sheikh Hodja Akhmed Yassavi, who was a poet, philosopher and Muslim saint. 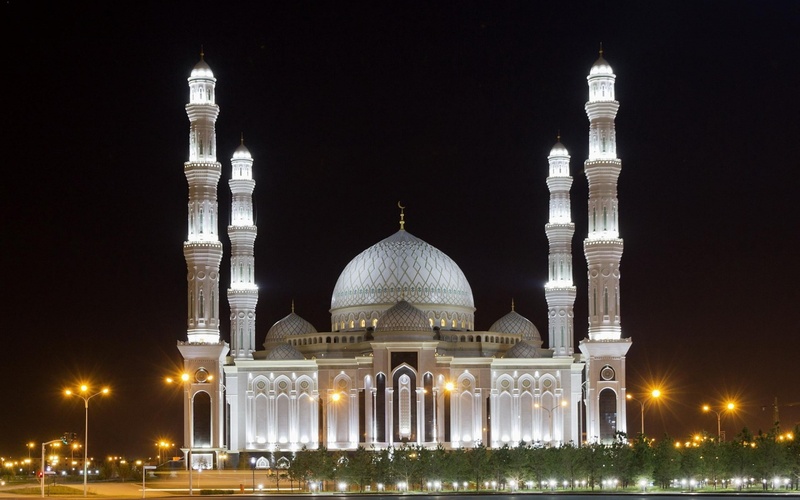 The Hasrat Sultan Mosque, one of the largest mosques in all of Central Asia, includes a hall for wedding ceremonies and rooms for reading the Koran and holding lessons and seminars. The shape of Baiterek represents a poplar tree holding a golden egg. The images come from a folktale of the tree of life, a central symbol in Turkic mythology, and Samruk, the legendary bird of happiness, who is said to have laid her egg between the branches of a poplar tree. The observation deck is 97 meters above ground level, referring to 1997, the year Astana was proclaimed Kazakhstan’s new capital. 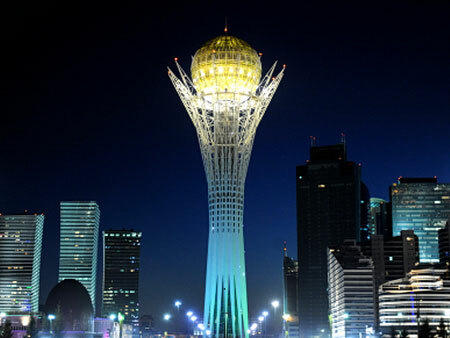 The top consists of two levels, one with a 360-degree view of Astana. The top level features a gilded hand print of Kazakh President Nursultan Nazarbayev mounted on an ornate pedestal. A plaque invites visitors to place their own hands in the imprint and make a wish, and newlyweds still in gowns and tuxes posing for photographs with their hands in the President’s print are a common site at the monument. Alongside the handprint, also oriented in the direction of the presidential palace, is a wooden globe and 16 radiating segments commemorating the Congress of Leaders of World and Traditional Religions. 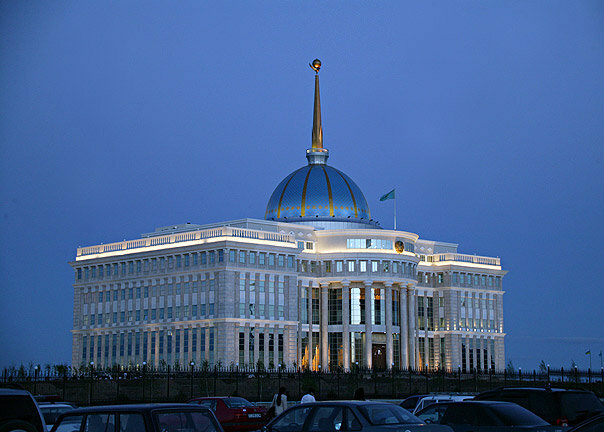 The Ak Orda or “white horde” in Kazakh, is the President’s residence. Highlights of the building’s ground floor are its Grand Central Hall, Hall of Press Conferences, Gala Hall and Winter Garden. The second floor contains offices; the third is used for international events and includes the Marble Hall, the Golden Hall, the Oval Hall, the Oriental Hall – built in the form of a yurt – and the Hall of Extended Negotiations. The fourth floor includes the Dome Hall, the government’s meeting hall and a library. The color gold features prominently throughout the complex and 21 types of marble were used for the floor patterns. The building’s shape evokes the dynamism of a flower’s opening petals as a metaphor for the dynamism of music itself. The building’s external structure comprises a series of curved, inclined walls made of concrete, with a cladding of blue-back painted glass panels. 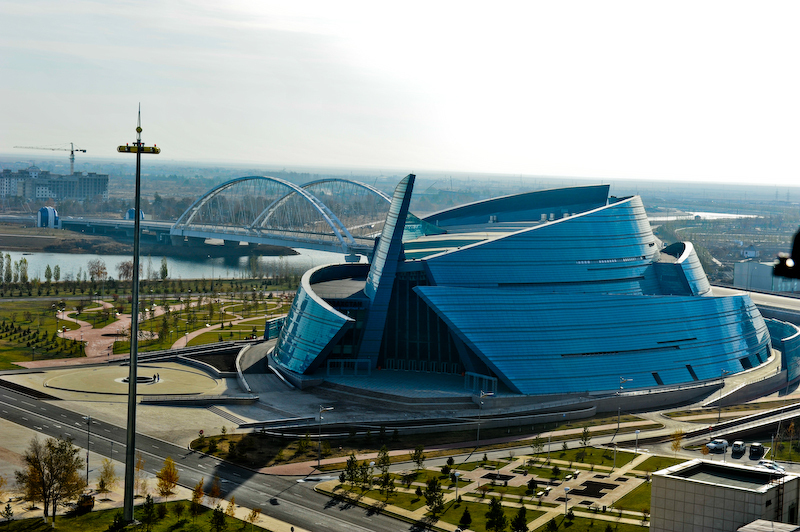 Those structures protect the building’s interior from Astana’s unpredictable weather conditions. 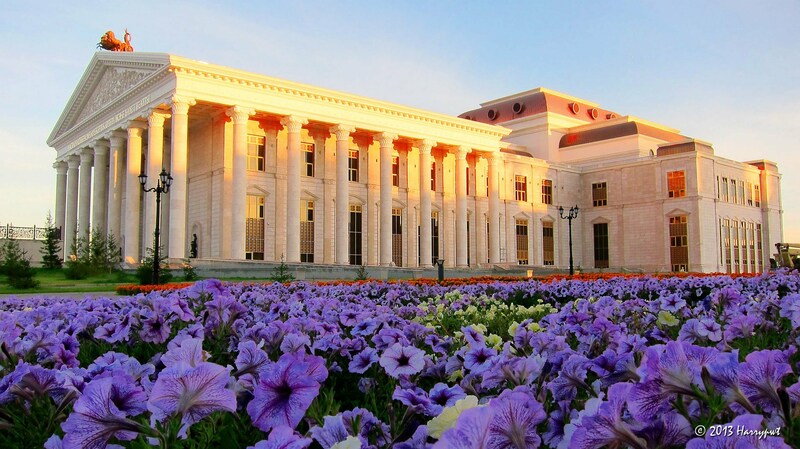 Central Asia’s largest theater and the world’s third-largest opera house, Astana Opera was created by masters from Italy, Germany, Switzerland and the Czech Republic. One of the theater’s main attractions is the 1.6 tonne chandelier in its entrance hall, 5 by 5.5 meters, of Bohemian crystal. 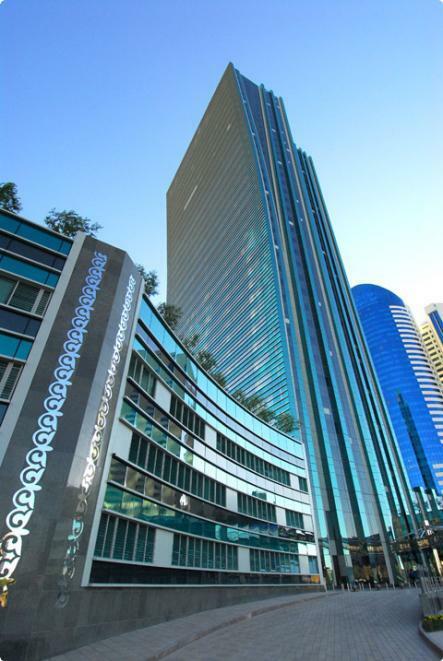 This three-tower complex hosts the headquarters of businesses, government administrative departments and private companies. 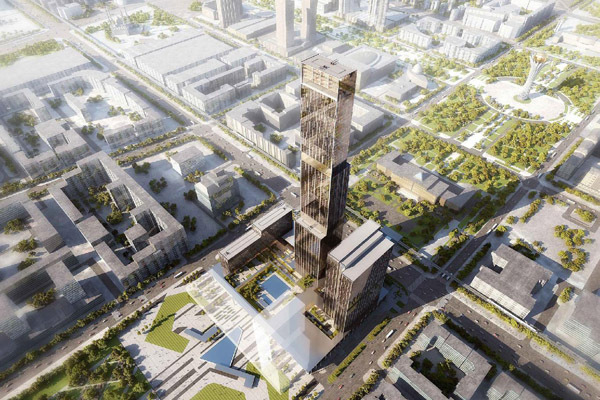 Projected to open in November 2016, the Abu Dhabi Plaza is set to be the tallest skyscraper in Central Asia. It will host hotels, offices, apartments, malls, gardens, and more and will also connect the airport and the city with the monorail that is also under construction and projected to open for EXPO 2017.